You're a good DM. You want to be an even better DM. I can help! Your time and creativity are valuable. Making those shining moments of awesome happen is something only you can do. Making cities? That's something a lot of people can do. And sure, it's a lot of fun - but is it still fun the third time this session your that PCs change their plans and change directions entirely? If you're looking for a hard object to hit your head against right about now, you are not alone. I used to have the same problem. I'd spend a lot of time and energy coming up with cool cities, then get flustered when the PCs decided to pick a random point on the map to head to, or switch taverns for the forth time during their stay. So I decided to solve that problem for good - in a way that didn't involve throwing things at my players. Maybe you can come up with amazingly detailed cities on the fly, and maybe you have hours of extra time each week to prepare. But both of those things aren't always true. And no one wants to disappoint their players. Having a stack of prepared cities around is nice. But setting books cost money, they take time to read, and they don't always fit your campaign all that well. What if you could get a detailed city by clicking a button? If it doesn't fit your game, click the button again and you have another one. A few clicks, and you have the perfect city - all in less time than it would take you to look up something in a book. That would save you money, time, and creative energy, which you could then put towards creating more of those shining moments of awesome. Why worry about preparing for next session, when you know you can create rumors, taverns, merchants and more in seconds? Spend those extra hours making something super cool for your players - or take a well-deserved break! Don't you want a few extra hours next week? And what about the confidence of knowing you have an infinity of setting details and potential plot hooks at your fingertips? I like having extra time and confidence, so I created a bunch of free generators to come up with things I needed to use in game a lot - taverns, merchants, and the like. People loved them and wanted more and better generators, so I put them together into themed packs with some all-new generators that solve common problems people have at the table. 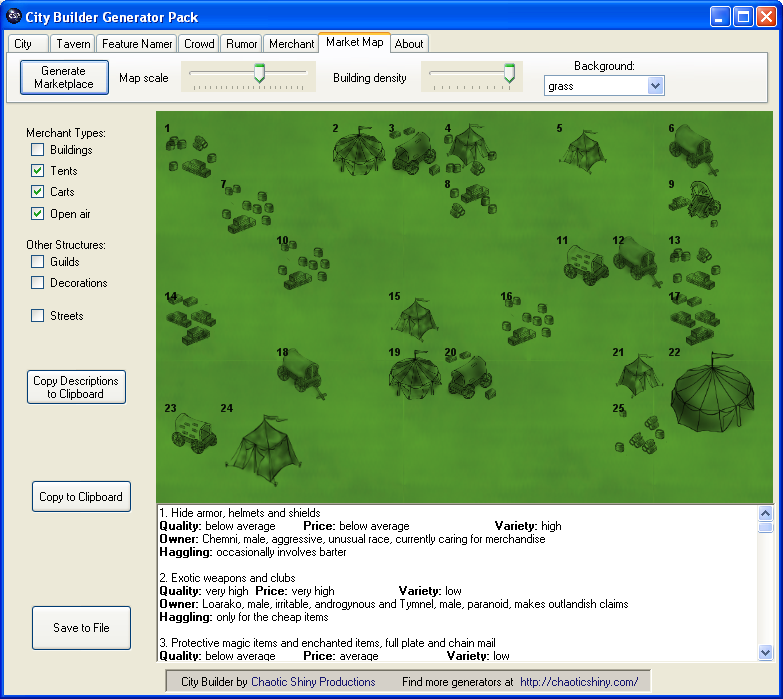 The City Builder Generator Pack costs a fraction of what most setting books cost, and it will save you hundreds of hours and lots of awkward moments at the table. Need a tavern that's more than just a name and a faceless barkeep? Want to fill that tavern with juicy rumors, each of which could be a plot hook? 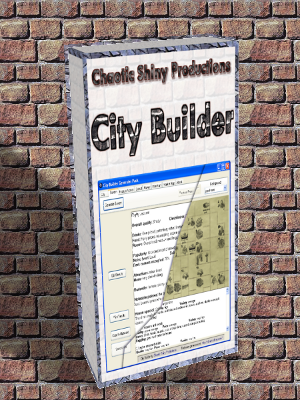 The City Builder has you covered. Stop having to choose between spending hours preparing for each session, or having your players view cities as nothing more than stops to sell loot. Next session, surprise them with detailed locations, taverns, merchants and crowds. 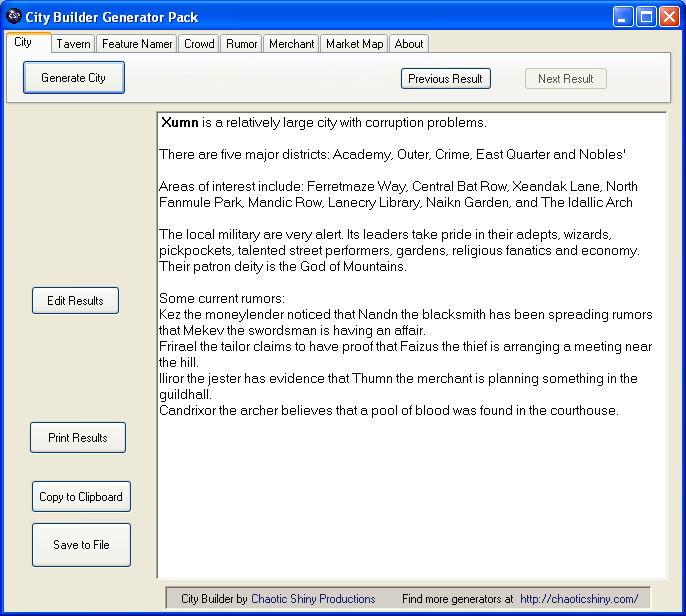 The Complete City Generator creates city overviews including name, districts, places of interest, and current rumors. The Tavern Generator is one of the oldest and still most popular generators on Chaotic Shiny, rolling up everything from drink quality to food availability to bartender quirks. The Feature Namer lets you tell your party about local attractions like The Skinny Thief Brewery, False Weasel Marketplace, the Brass Basilica and North Namn Academy. 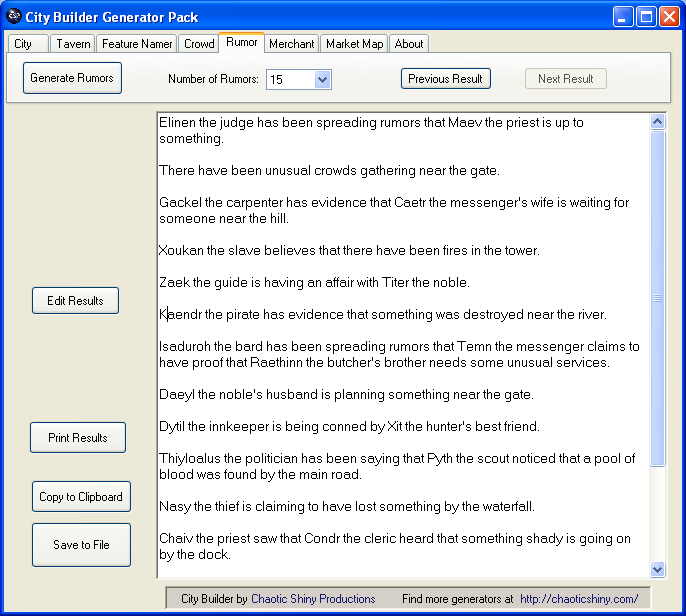 The Crowd Generator creates quick one-sentence descriptions of passersby, adding color to your crowds. The Rumor Generator tells you who saw whom doing what, who's looking for unusual services and where the mysterious pool of blood was found. 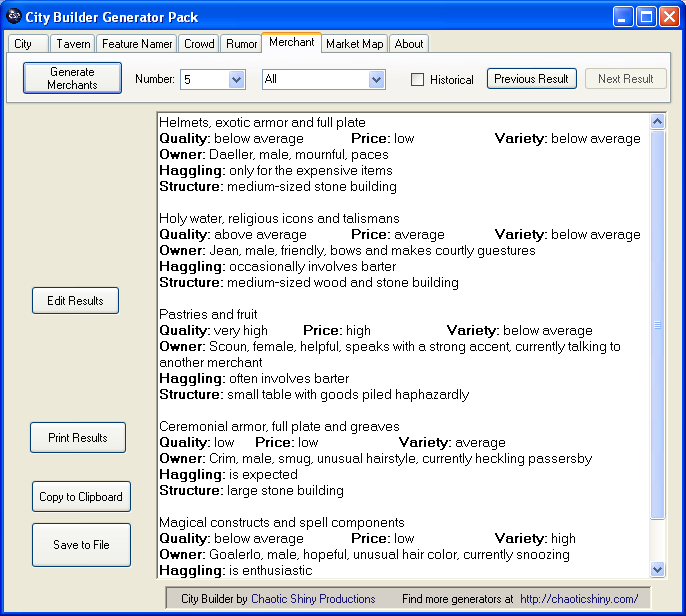 The Merchant Generator describes shops and stalls and their owners, for all your shopping needs. 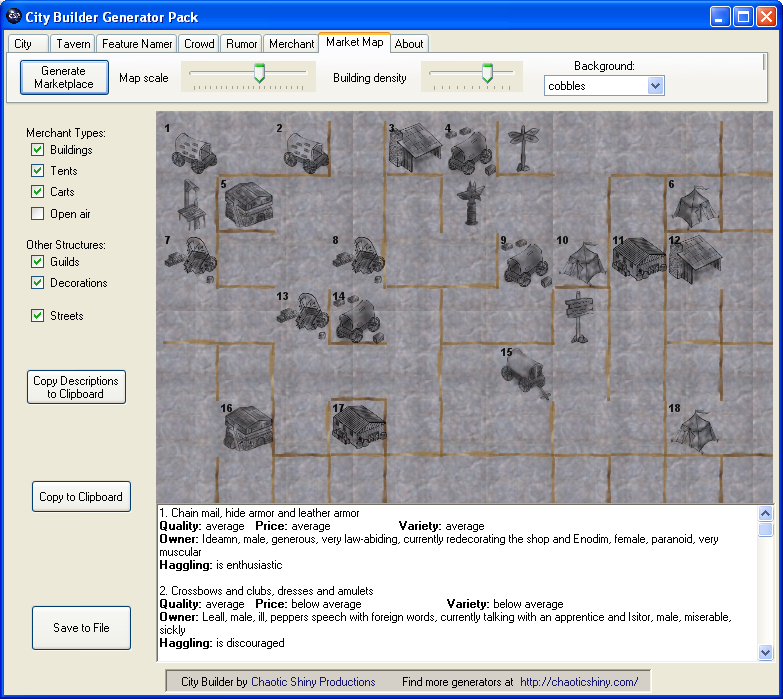 The Market Map Generator creates maps of any shape and size (as long as that shape is a rectangle) of anything from a crowded cobblestone city market to a caravan on the plains, or even a blank background for those of you who haven't yet invested in a laser printer. 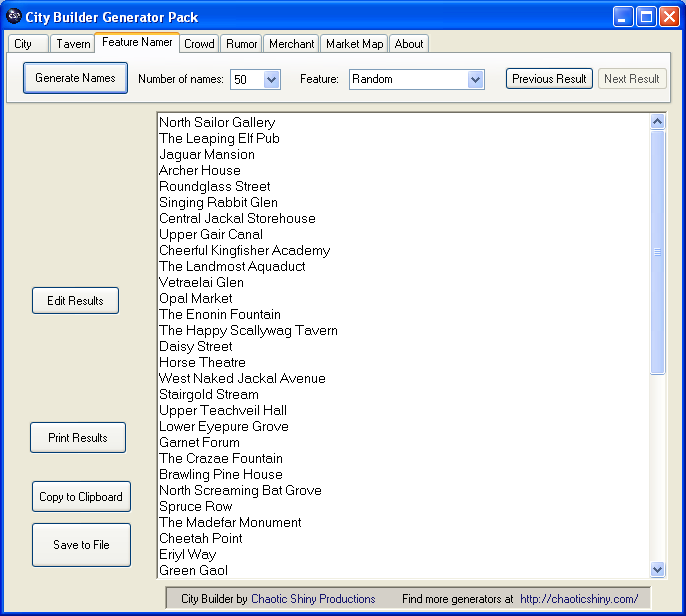 Print results directly from the City Builder - no need to even open another program! Your Options panel allows you to save your window size, menu positions and most recent results across sessions. You can open up the City Builder and find it looking exactly the way it was when you closed it. People keep telling me to charge $20 or more for this, but I'd rather let you spend that money on shiny dice. (Hey, that's what I'd spend it on.) And if you decide the City Builder isn't worth it, and you'd rather spend that money on dice anyway? Let me know within 30 days, and I'll give you a full refund. There's no risk to you - either the City Builder helps you make your game better, or you've lost nothing by trying. So go ahead and click that "Buy Now" button. (Or even the "Add to Cart button if you're feeling adventurous and want to check out the other generator packs.) Save a few hours planning for your next session. Make your players think you're the best DM ever. 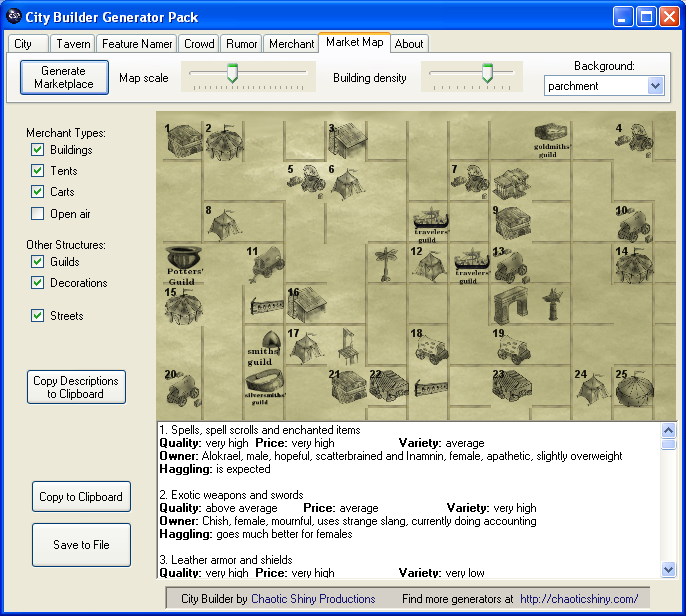 If you think this is interesting, you might also find the Kingdom Builder Generator Pack useful.